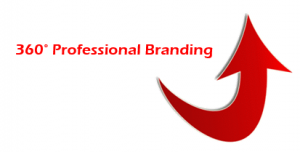 My comprehensive Career Solutions Packages provide 360° professional branding to help you gain the competitive EDGE and position you well for your next job. In today’s competitive job market, you need more than a strong resume to advance your career. Your resume, cover letter and LinkedIn profile work together to solidify your professional image and are most effective when used in conjunction with a strategic job search plan that includes face-to-face and online networking. 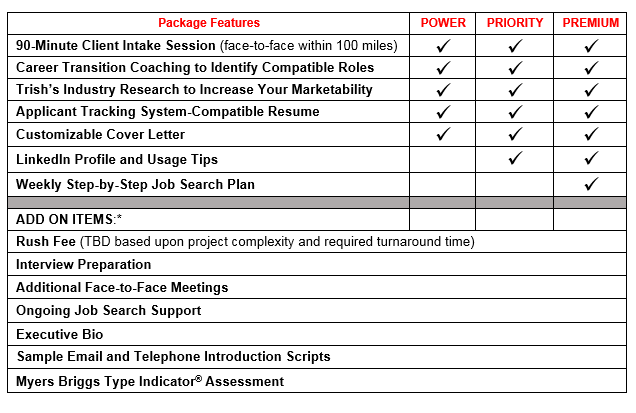 Package prices are based on project complexity and range from $595 to $1295 depending upon your industry and employment level (entry level, mid-career professional, management or executive). Each Power, Priority and Premium package is completely tailored to your specific needs. This investment in your future earning power offers a significant ROI. I have helped hundreds of job seekers achieve their career goals, with most winning immediate interviews and job offers with considerably higher compensation. Call today for a free consultation to discuss your specific needs and determine how we can best work together. I do not include samples of my proprietary resumes online, but I’d be glad to show you a sample of my work. Request a sample. Email me your current resume or complete a Resume Questionnaire.